Comfortable seating product, with beverage and food compartments, is perfect for tailgating, hunting, Fishing, Camping, Rugby, Picnicing or any outdoor activity! The TaleGator is the ideal product for anyone requiring comfortable seating while outside of their pickup. 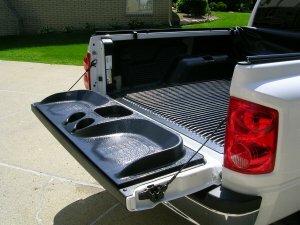 A pickup's tailgate becomes a popular seating area. 2 x 4x4 tyres continental world contact. 205R16 60 to 70 percent life.